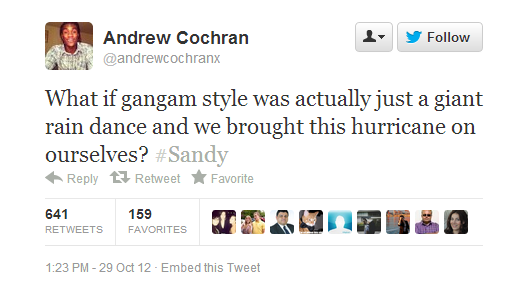 How did people use Twitter during Hurricane Sandy? For millions who lost power but could still access the internet on mobile devices, Twitter served as a critical lifeline throughout the disaster that struck on October 29. At least a few news operations, such as Huffington Post and the aggregator BuzzFeed saw their servers go down and turned to Twitter and other social media to deliver reports. According to Twitter, people sent more than 20 million tweets about the storm from October 27 through November 1. This was more than twice the usage from the two previous days. In New York, usage peaked on October 29 around 9 pm, according to Twitter’s internal data, the same time that a Con Edison substation exploded in Manhattan’s East Village, knocking out power to much of lower Manhattan. What were the main thrusts of the posts? 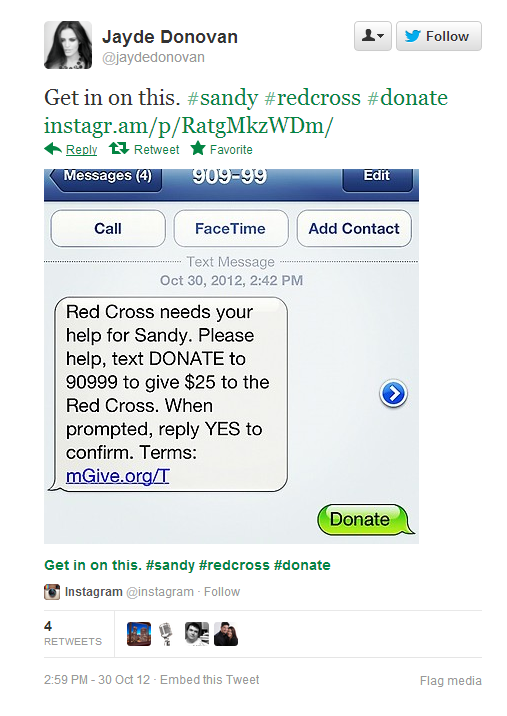 What would an individual searching for posts about Sandy have found in the social network? 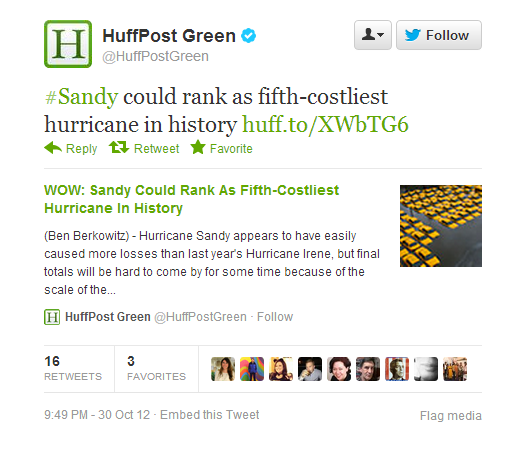 From the day the storm made landfall on October 29 through Wednesday the 31st, news, information, photos and video made up more than half of all the Twitter conversation, according to a study by the Pew Research Center’s Project for Excellence in Journalism, using Crimson Hexagon technology. Hurricane Sandy Conversation on Twitter Percent of assertions Date Range: October 29, 2012 – October 31, 2012 PEJ analysis using Crimson Hexagon technology The largest share of this news and information, fully 34% of the Twitter discourse about the storm, involved news organizations providing content, government sources offering information, people sharing their own eyewitness accounts and still more passing along information posted by others. Some of these were tales of courage and helping out neighbors during and after the storm, such as an Indian news organization’s first-hand account from a reporter on the ground in New York. 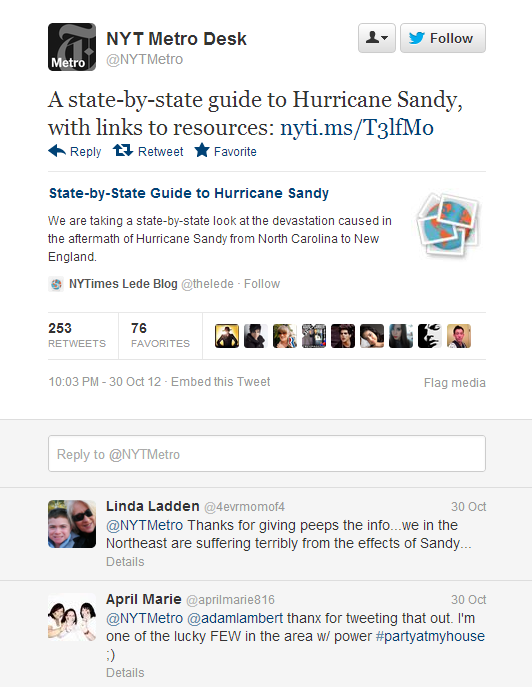 The New York Times shared a state-to-state guide to the hurricane, showing tweets from utilities and reporters in other states and resources for people to use. But, as can happen in the open and fast-moving environment of social media, some accounts shared by many, including mainstream news organizations, turned out to be false. One of the most-discussed was the claim that the New York Stock Exchange floor had flooded with three feet of water and that the power company, Con Edison, was shutting off power to all of Manhattan. The original tweets, from @ComfortablySmug, were passed along by a number of news organizations, including CNN and New York Magazine. Others on Twitter quickly debunked the rumors. The aggregator BuzzFeed eventually identified @ComfortablySmug as Shashank Tripathi, a hedge fund manager and campaign manager for Republican congressional candidate, Christopher R. Wight. Tripathi resigned from his campaign position on Tuesday. 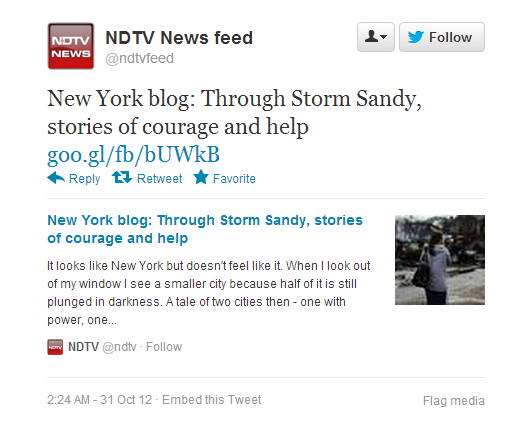 In the days following the storm, news organizations and others continued to share news via Twitter. The second largest share of Twitter conversation about the hurricane over these three days, fully 25%, involved people sharing photos and videos, speaking to the degree to which visuals have become a more common element of this realm. These images included everything from pictures and video of the storm, post-storm destruction, falsified pictures about the disaster and self portraits of people during the storm. There was interplay, too, between news and eyewitness content with news organizations retweeting or sharing citizen images. 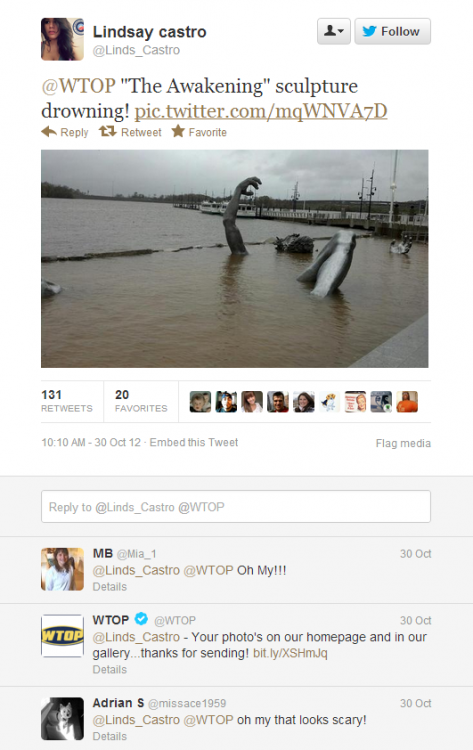 WTOP, a news radio station in Washington, D.C., shared an image of a sculpture in Maryland, underwater, taken by a citizen. As with some of the text-based tweets, though, some images turned out to have been faked. 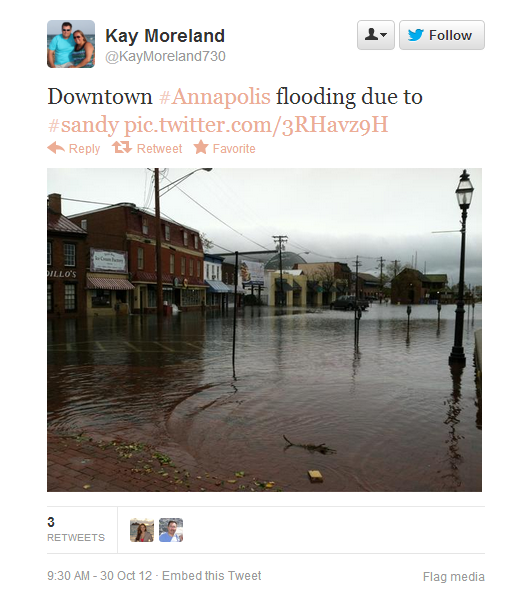 Twitter users were quick to point out the false images that had been doctored or even from previous storms. One image, of a flooded McDonalds, was actually a work of art from years earlier. How much of the imagery on Twitter was fake was hard to know, and that in itself became a topic of discussion. An Atlantic article explaining which photos were real and which were fake, was often shared over social media. 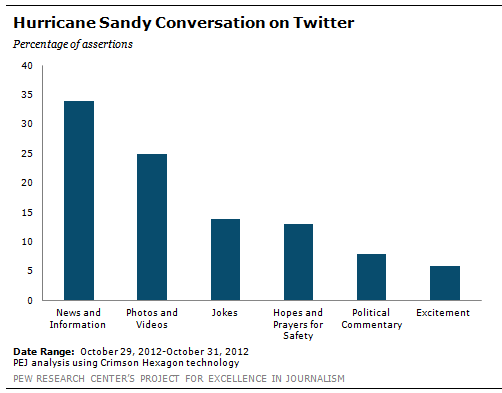 Beyond news and information, some turned to humor: 14% of the conversation about the storm involved jokes. 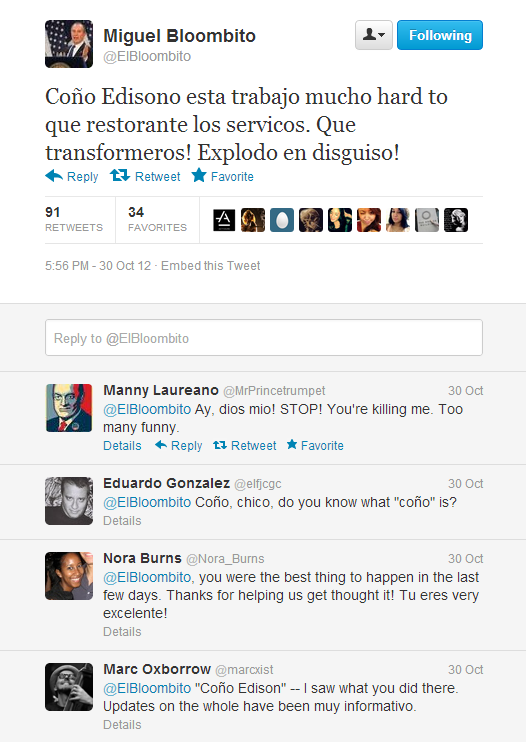 And the humorous Twitter feed @ElBloombito, which makes fun of Mayor Michael Bloomberg’s Spanish, offered several posts which were shared by many. As the level of destruction set in, though, the jokes became less common, declining by roughly half from the first day to the third, according to the PEJ analysis. 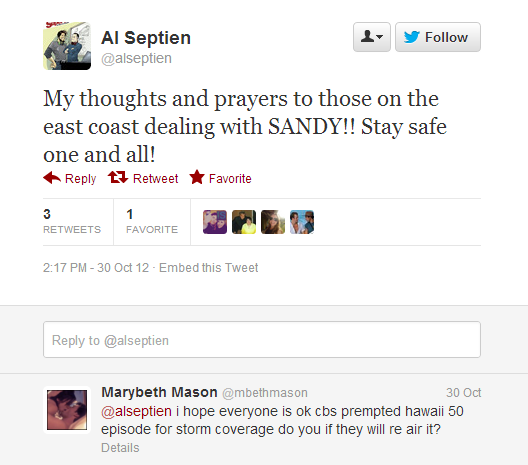 Prayers and well wishes were also a large part of the conversation, 13% of the Sandy discussion. This also included people urging their followers to donate to organizations that provide aid to those affected by the hurricane. Many of these tweets came from people unaffected by the storm, who weighed in with their concern. Other popular topics of discussion on Twitter about Sandy included political comments (8%), many of which were critical of one of the two major presidential candidates. Still others (6%) were excited that the hurricane was coming, mainly voicing their pleasure that school would be canceled.